Call us today about our Sunday school program! New Hope Baptist Church, located in Portsmouth, NH, is a Baptist fellowship that loves to praise God and have a good time worshipping in His presence. We are a diversified congregation comprised of members from many different backgrounds and ethnic groups having various religious upbringings. Our services are focused around learning the teachings of God through gospel readings and gospel music. When you worship with us, you embark on a journey that will help you live a more prosperous life. The teachings of God help us understand ourselves and the great world around us. We offer bible study and Sunday school services for children to better understand the teachings of the bible. Our staff is dedicated to helping children better understand their faith. We help children understand how the teachings of the Bible provide guidance in their lives. When children learn about the teachings of God, they can better understand the world around them. The teachings of God help children understand the importance of forgiveness. Bible study can provide children with stronger faith in God and a more developed moral compass. We take pride in the development of our Sunday school students. We give students the opportunities to learn about their faith in a fun and nurturing environment. We feel that children should understand the teachings of the bible to improve their lives. We have a wonderful Sunday school program for Portsmouth, NH! We have Sunday school on Sunday mornings where children can learn about God. They will take part in Bible study and begin to better understand the teachings of the bible. Our Sunday school teachers are committed to sharing the teachings of Christ and helping our children find their faith. Sunday school is beneficial for children because it provides a structured form of teaching God's word. These programs tailor Bible teachings to the age group of the class. Our Sunday school program helps children understand the teachings in a way that is easy to understand. Together we are committed to creating and maintaining a place where people from all walks of life can come to feel love and to be accepted; a place where burdens are laid down and souls are lifted up; a place where everybody is somebody. We believe that the teachings of Christ can help everyone learn to better understand themselves and their faith. We are concerned about and involved in community building through our Missionary outreach programs and our Youth Ministry, as well as our inspirational Music Ministry, which features a wide range of traditional and contemporary gospel music. These ministries all serve to bring God’s life affirming message of forgiveness, love, and hope to a sinful and dying world. When you are in the Portsmouth, NH area, looking for a church with excellent gospel music, there is no place that does it quite like New Hope Baptist Church. 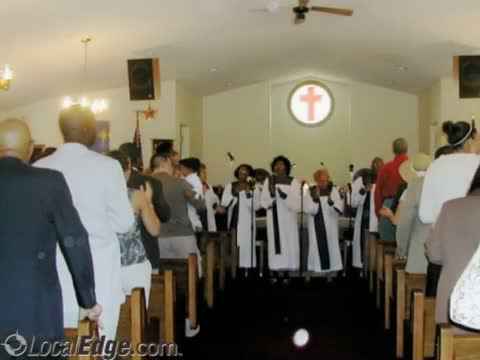 Join us on Sundays and worship with us over beautiful gospel music. We look forward to meeting you and spending time with you. Remember our name when you are searching for the gospel music you enjoy! We welcome you to join our community of worshipers and pray with us. Join a Bible study group and grow in your personal faith, or simply come to worship with us every week. In particular, we are very proud of the gospel music at every service. If you love gospel music, you are in for a treat! If you reside in Portsmouth, we urge you to visit our church and let us help you on your spiritual journey. Come join us in our bible study program in Portsmouth, NH! Serving Portsmouth and the seacoast area for over 40 years, our doors swing open on the “hinges of love . ” All are welcome to come and share in our Christian walk and fellowship that includes a weekly Prayer Meeting, a weekly Bible study, Sunday school on Sunday mornings and a lively worship experience. More information on special programs and current activities is included in our church website, www.newhopenh.com. We offer a wide range of programs at our Sunday school, including Bible study and more. We believe in inculcating strong values and giving the right direction to your child's religious upbringing. We help our children understand faith and develop a strong spiritual core that will guide them through hardships. We also offer great gospel music at our church in Portsmouth. If you need more information on our special programs and Bible study programs, visit our website. If you are interested in joining our Bible study, please give us a call. We love to welcome new guests to our gatherings. We hope to dive into God's word with you and bring the best understanding to you at our Bible study. If you live in the area and don’t have a church home, or if you are visiting from out of town, please stop by the little white church on Peverly Hill Road and be blessed with a very warm and genuine welcome from our Pastor, members and officers. Our Pastor, Dr. Arthur L. Hilson is the spiritual leader and counselor to the members of New Hope Baptist Church as well as a history teacher to students at Portsmouth High School. Pastor Hilson has often stated “I do not meet strangers, I meet people for the first time, but I do not meet strangers.” He is also well known within the local church community for responding “I’m too blessed too complain!” when asked how are you Reverend Hilson? A very charismatic preacher, Pastor Hilson is quite active in the United Baptist Convention of Mass, RI and NH, and former President of the American Baptist Convention of Vermont & NH. He is a native of Cincinnati, Ohio and has held positions at both the University of MA and the University if New Hampshire. Pastor Hilson is married to the former Florine McClary; they have, as a team, served New Hope faithfully for the last 19 plus years. If you are in the Portsmouth area looking for a new church, check out New Hope Baptist Church. Join us for our bible study and enjoy our gospel music! If you have children, bring them to our Sunday school program where we welcome children from all backgrounds! and giving that the gospel might be preached and lived in all the world.